Find it on Steam on Wednesday. 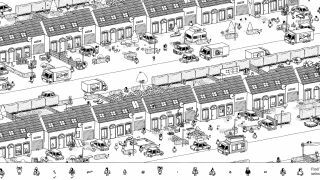 I have been eagerly awaiting the release of Hidden Folks, a Where's Wally-esque game about combing through scenes in order to find people hidden from view. The major differences between this and Where's Wally/Waldo are the absence of colour, the astonishing mouth-noises, and the fact that each scene is interactive. You'll pull at blinds, open doors, and prod at bushes to find the folks obscured in each beautifully illustrated stage. While you do so, the scene's inhabitants will mill about, and cars and buses will pass by on the monochrome roads. It's rather lovely. It sounds like the sort of game that would be perfect on the iPad, but it's coming to PC too, and I'm very glad of that. In four days, and for $7.99, you'll be able to play it, for Hidden Folks will be not-so-hidden from February 15. There's a Steam page here if you want to take a look at the game before then.